Now, a poster of Swamp Thing in that Farrah Fawcett pose…that I’d display. So I checked my email yesterday morning and immediately received about, oh, a billion emails telling me about these limited edition Swamp Thing movie poster prints that are going on sale today (or may have already gone on sale by the time you read this) from Mondo Tees. The regular edition is handnumbered and limited to 230 copies at $45 a pop, and the even more limited (90 copies) glow-in-the-dark edition is $90. You can get a better look at the crazy amounts of detail in these posters right here. Apparently the sale will be announced at some time tomorrow on the official Mondo Twitter feed, so keep your eyes peeled there if you need one of these on your wall. I’m tempted, particularly by the glow-in-the-dark poster (which wouldn’t be the first glow-in-the-dark Swamp Thing item I own), but I’m not really a poster guy. 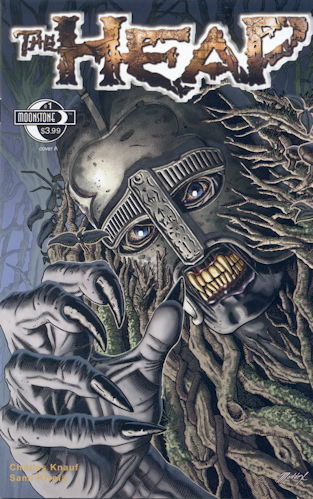 I already have multiple Swamp Thing posters still rolled up and sitting in a closet (including one of these) and don’t really want to drop a c-note (or even half a c-note) on something that probably wouldn’t be displayed. But I want to thank everyone who emailed, Twittered, or commented to let me know about this new bit of Swamp Thing merchandise. I really do appreciate it, and if you see any new goodies, don’t be shy about letting me know! …It’s a bit amusing, and a tad intimidating, to know that people all around the world, that I’ve never met, think of me whenever they encounter anything Swamp Thing-ish. I’m internationally recognized for my nerdly obsessions! Also, special thanks to my Canadian twin Steven for being first in line to let me know about these posters. A commenter asked in yesterday’s post if I’d read the new Heap comic yet. Oh, do you mean…this one? The latest revival of the swamp monster originally introduced in the Golden Age Airboy comics, I thought it wasn’t bad. The monster looks different enough from his four-color brethren, what with that hideously creepy mask, and it’s more mystical in nature than scientific, like Marvel’s Man-Thing. Without getting into any spoilerish detail, it does follow the four-color swamp creature tradition of a man trapped within a hideous monster body, but approaches it in a fashion different enough from Swamp Thing and Man-Thing, and even previous versions of the Heap, to make it feel reasonably new. There is a character in the story who has bit of a John Constantine-y feel to him, and fills a similar role as John did in his earliest apperances, but…again, it’s presented in a way that doesn’t make it feel like a retread. So, yes, I enjoyed it, and I’m looking forward to future issues. Still not a patch on this work of genius, however. Would Swamp Thing be displaying berries and twigs, in this posed poster? “America’s Favorite Superhero” – Really? Has it been determined that The Heap is in the public domain? I’ve wanted to do a Heap comic since I first read about it in The Comic-Book Book. Maybe I will for this year’s 24-hour comic day.